The Ferrero Golden Gallery is a delightful assortment of Ferrero flavors. This is the perfect present to any chocolate lover for the holidays. Also a great gift to bring for a party or dinner occasion. I picked up one recently as an evening treat with some coffee or tea. 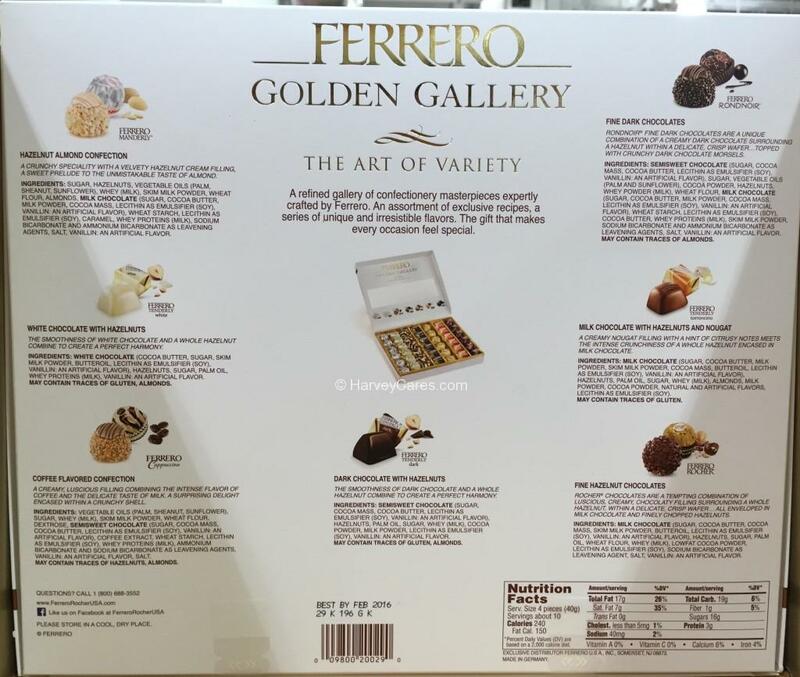 There are 7 unique flavors in the Ferrero Golden Gallery box. All are perfectly and individually wrapped – good for sharing and storage. At a total of 42 pieces, this box is a mix of great value and pleasure! The flavors are wonderful and each is distinctly delicious. 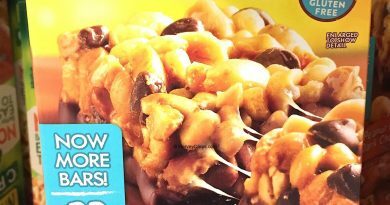 Ferrero Manderly – a hazelnut almond confection. Ferrero Tenderly – a white chocolate with hazelnuts. Ferrero Cappuccino – a coffee flavored confection. Ferrero Tenderly Dark – a dark chocolate with hazelnuts. Ferrero Rocher – a fine hazelnut chocolate. Ferrero Tenderly Torroncino – a milk chocolate with hazelnuts and nougat (my favorite). And Ferrero Rondnoir – a fine dark chocolate. Looking to Purchase Ferrero Golden Gallery? Shopping for the Best Chocolates and Sweets? The Ferrero Golden Gallery is wonderful. Back to the good stuff! Take a look at the detailed review of Ferrero Golden Gallery below. Ingredients: Sugar. Hazelnuts. Vegetable oils (Palm, Sheanut, Sunflower). Whey (Milk). Skim milk powder. Wheat flour. Almonds. Milk chocolate (Sugar, Cocoa butter, Milk powder, Cocoa mass, lecithin as emulsifier (Soy), Vanillin: an artificial flavor). Caramel. Whey proteins (Milk). Sodium bicarbonate and ammonium bicarbonate as leavening agents. Salt. Vanillin: an artificial flavor. Ingredients: White chocolate (Cocoa butter, sugar, skim milk powder, butteroil, lecithin as emulsifier (Soy), Vanillin: an artificial flavor). Hazelnuts. Sugar. Palm oil. Whey proteins (Milk). Vanillin: An artificial flavor. May contain traces of gluten and/or almonds. Ingredients: Vegetable oils (Palm, sheanut, sunflower). Sugar. Whey (Milk). Skim milk powder. Wheat flour. Dextrose. Semisweet chocolate (Sugar, Cocoa mass, Cocoa butter, Lecithin as emulsifier (Soy), Vanillin: An artificial flavor). Coffee extract. Wheat starch. Lecithin as emulsifier (Soy). Whey proteins (Milk). Ammonium bicarbonate and Sodium bicarbonate as leavening agents. Vanillin: an artificial flavor. Salt. May contain traces of hazelnuts and/or almonds. Ingredients: Semisweet chocolate (Sugar, Cocoa mass, Cocoa butter, Lecithin as emulsifier (Soy), Vanillin: An artificial flavor). Hazelnuts. Palm oil. Sugar. Whey (Milk). Cocoa powder. Milk powder. Lecithin as emulsifier (Soy). Vanillin: an artificial flavor. Ingredients: Milk chocolate (Sugar, Cocoa butter, Cocoa mass, Skim milk powder, Butteroil, Lecithin as emulsifier (Soy), Vanillin: an artificial flavor). Hazelnuts. Sugar. Palm oil. Wheat flour. Whey (Milk). Lowfat cocoa powder. Lecithin as emulsifier (Soy). Sodium bicarbonate as leavening agent. Salt. Vanillin: an artificial flavor. Ingredients: Milk chocolate (Sugar, Cocoa butter, Milk powder, Skim milk powder, Cocoa mass, Butteroil, Lecithin as emulsifier (Soy), Vanillin: an artificial flavor). Hazelnuts. Palm oil. Sugar. Whey (Milk). Almonds. Milk powder. Cocoa powder. Natural and artificial flavors. Lecithin as emulsifier (Soy). Ingredients: Semisweet chocolate (Sugar, Cocoa mass, Cocoa butter, Lecithin as emulsifier (Soy), Vanillin: an artificial flavor). Sugar. Vegetable oils (Palm and sunflower). Cocoa powder. Hazelnuts. Whey powder (Milk). Wheat flour. Milk Chocolate (Sugar, Cocoa butter, Milk powder, Cocoa mass, Lecithin as emulsifier (Soy), Vanillin: an artificial flavor). Wheat starch. Lecithin as emulsifier (Soy). Cocoa butter. Whey proteins (Milk). Skim milk powder. Sodium bicarbonate and ammonium bicarbonate as leavening agents. Salt. Vanillin: an artificial flavor. The Ferrero Golden Gallery box serving size is 4 pieces (40 g). There are about 10 servings per container. 240 calories per serving. 150 calories from fat per serving. The Ferrero Golden Gallery is a 14.1 OZ (0.88 lbs) container. 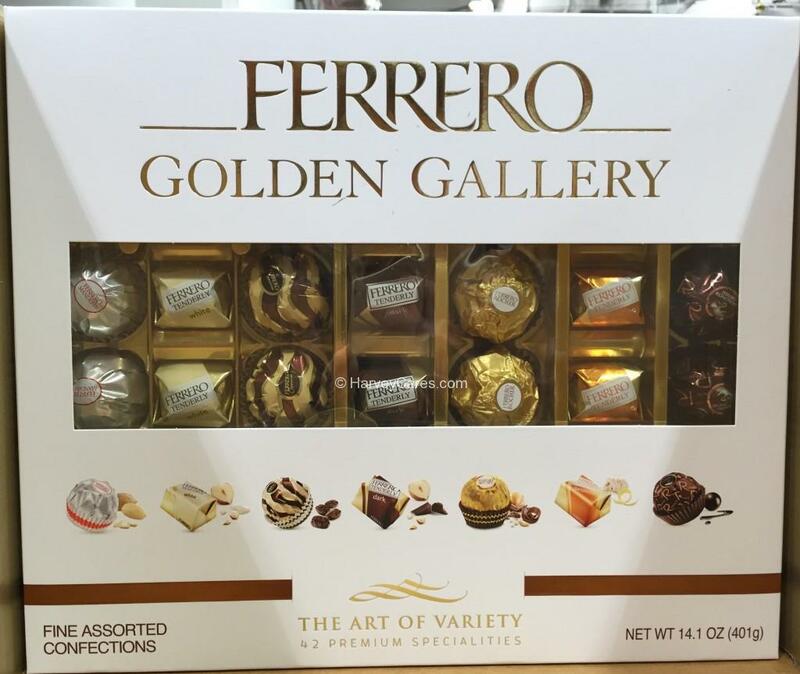 The Ferrero Golden Gallery is truly a great treat for many occasions! 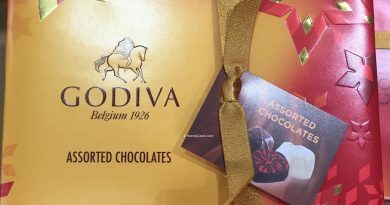 I must say that it makes a great gift to any chocolate lover. This also makes a wonderful afternoon tea snack. What I like about Ferrero Golden Gallery are the 7 different and unique flavors. Individually wrapped – perfect for sharing. Everyone will find their favorites. With a total of 42 pieces, there is plenty to go around. 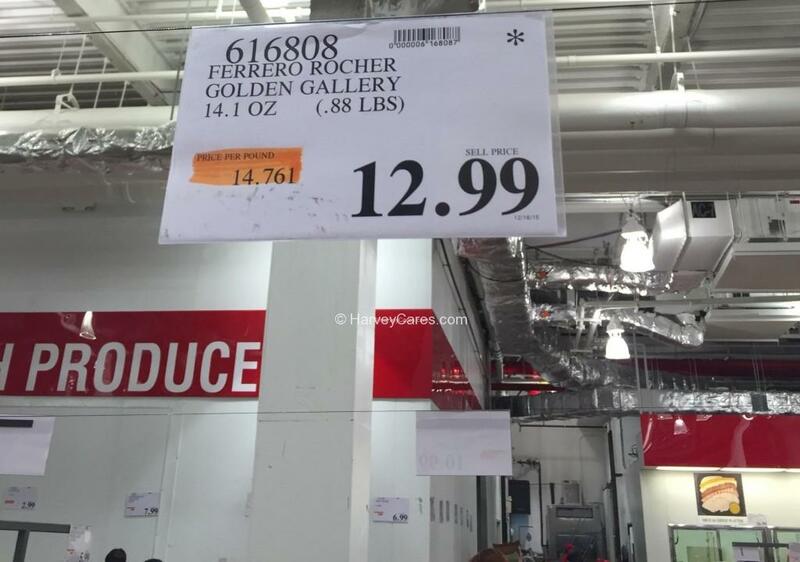 Ferrero Golden Gallery is a seasonal item so grab it when you can! 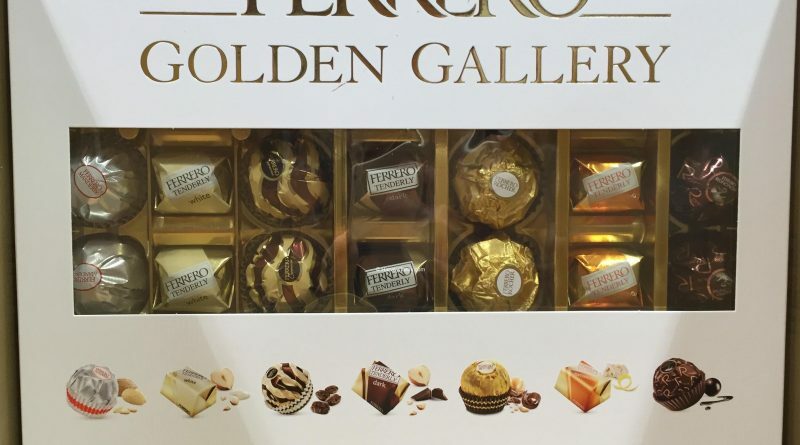 Have you bought the Ferrero Golden Gallery before?